We use the term simultaneous interpretation for the type of interpreting that is performed on the spot and in a manner parallel to the discourse. In other words, the message is rendered while the speaker is still talking, which means that the original discourse and the interpretation overlap. The Nuremberg Trials marked the beginning of simultaneous interpretation as we know it today, however, this mode was already being used before this event took place. In any case, simultaneous interpretation is the most recent and, at present, the most widespread form of interpreting. For many years the demand for this mode has been increasing, and has replaced other modes such as consecutive interpretation. Simultaneous interpretation is chosen at almost all formal occasions where a large group of people from different countries gets together (The Court of Justice of the European Union, the European Union and United Nations Organization meetings, summits, international congresses, conferences with many speakers and a large audience, etc.). This mode serves as an umbrella under which there are various specialties such as chuchotage, or whispered interpretation, relay or chain interpretation, and sight translation. More information about these specialties can be found in the corresponding headings, where the main differences between them and simultaneous interpretation are clarified. The most relevant characteristic of simultaneous interpretation is that it is performed in real time and with the use of technical equipment. 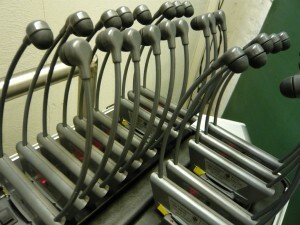 This mode is performed in closed booths, equipped with microphones, headphones and recorders. Normally, under ideal conditions, the booths are made to accommodate two interpreters that take turns interpreting, since each of them should not work for more than half an hour or forty minutes at a time. Also, the interpreters need to be able to clearly see the main room from the booth, as well as all possible visual aids that the speaker uses. The simultaneous interpreter makes greater use of his or her short-term memory and pays special attention to his or her voice, since this is the only reference point that exists between the idea that the speaker wishes to convey and the audience that the message is directed at. Furthermore, the interpreter needs to make sure that the time spent in rendering the message is not excessive, so that the interpretation and the original discourse are more or less parallel. There will always be a slight gap between the original discourse and the interpretation and will vary depending on the circumstances. This time lapse is known as a time lag, and the interpreter must ensure that it is adequate at all times.